It is with heavy hearts that we announce the passing of our beloved mother, grandmother and great-grandmother at Carman Memorial Hospital. Left to cherish her memory are her daughter Annabelle (Roland) Bauche, and her grand-daughters Adrienne (David) Popke and Carly (Quinn) Friesen and great grandchildren Dylan and Tommy Friesen. She is also survived by her sister Ruth Anderson and her brother George (Donna) Jackson. 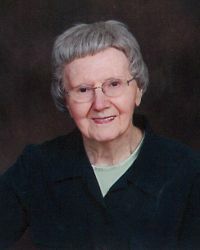 Mom was predeceased by her parents George and Vera Jackson, her cherished husband Ross (2000), her sister and brother in-law Eileen and Lorne Hennan, her sister and brother in-law Mae and David Ellis and her brother in-law Gordon Anderson. Mom’s teaching career eventually took her to Sperling where she met and married Dad in 1952. She spent the next fifty years there and moved to Carman in 2002, where she resided until her death. One of the highlights of Mom’s life was when she was inducted into the Manitoba Softball Hall of Fame as a member of the 1947-1952 Sperling Girls Softball Team. Mom had a special love for children, sports, animals and music. The family would like to thank the caring staff at Carman Memorial Hospital for their kindness and concern. In lieu of flowers, donations may be made to CancerCare Manitoba Foundation, 1160-675 McDermot Ave, Wpg, MB, R3E 0V9 or Carman Area Foundation (Sperling Fund), Box 160, Carman, MB, R0G 0J0. At Mom’s request, cremation has taken place and a private family service will be held at Doyle’s Funeral Home. Interment will take place in Sperling Cemetery.